Hola hola! I study Chemistry and Physics at the College of William & Mary. I love traveling and hope to go back to Spain after I graduate to work in a chemistry research lab. I am also an avid photographer and cheese expert! Hi! 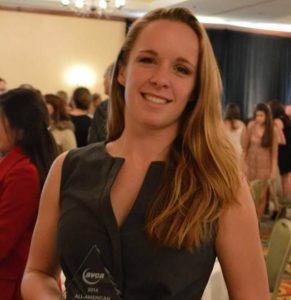 I'm Cara Coffin and I'm a Junior at Christopher Newport University. I am a Spanish major with double minors in Leadership Studies and International Culture & Business. Spending a semester with Centro Mundolengua has given me the opportunity of a lifetime and truly experience another country and culture. Other than being able to grow my Spanish language skills I was able to experience first hand the amazing culture of Andulusia. I love traveling great food and new adventures. If you have any questions please reach out to me! Hi! My name is Briana Sutton, and I am a student-athlete at Christopher Newport University. I am double majoring in Sociology: Criminology and Spanish and I am a member of both the volleyball and the track and field teams at CNU. When I graduate I would like to work with the federal government against human trafficking, and I am looking into Master's programs abroad for immediately after undergrad, but for now I am working on improving my Spanish and my intercultural skills by spending part of my summer with Centro Mundolengua and the University of Cádiz. I look forward to the opportunity of studying abroad as well as sharing my experiences with other students and individuals, and I can't wait to get started in Cádiz! Hi! 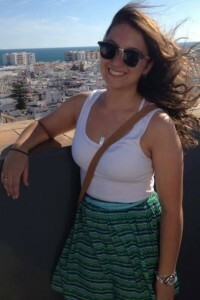 My name is Claire Flynn and I’m a Junior at the College of William and Mary majoring in Hispanic Studies. I’m incredibly excited to be studying abroad this semester in Seville, Spain with Centro Mundolengua! So far, my time abroad has been incredible and it’s been a truly amazing opportunity to be immersed in both the Spanish language and culture. Around Sevilla I can be found jogging through Parque de Maria Luisa, volunteering with Federación del Deporte Adaptado, and seeking out dessert at all hours of the day. I can’t wait to share my adventures abroad and please let me know if you have any questions! “Muere lentamente quien no arreisga el cierto por el incierto.” (Dies slowly he who does not risk certainly for uncertainty). I packed my bags as a college freshman for my first major international trip to Cadiz organized by Centro MundoLengua program and haven’t stopped exploring since. 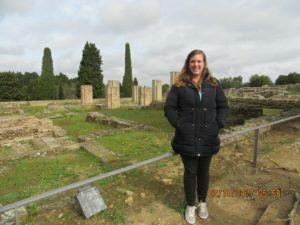 I have studied abroad with Centro MundoLengua for a total of two years, completing half of my Economics and Spanish majors in Sevilla, Spain. While in Spain I met some of my best friends, acquired a distinguished palate for tapas, and traveled from Barcelona to Budapest - and everywhere in between. 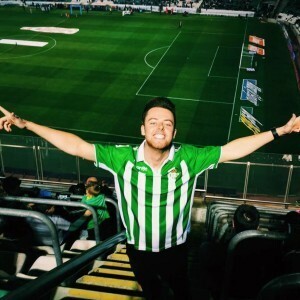 My experiences in Spain have formed a large part of who I am and I hope to use what I learned there to pursue a career in International Finance. If you have any questions, especially about Centro Mundolengua’s integration programs, I would love to answer them for you! Hola! 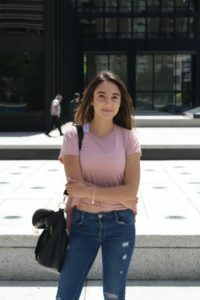 Mon nom est Emily Dakkak et j'ai 18 ans. Je commence mon Baccalauréat en Anthropologie à l'Université Concordia en septembre 2016. J'ai une passion pour différentes cultures et le voyage. J'ai très hâte de passer deux semaines en Espagne avec Centro Mundolengua ce juillet prochain et de partager mon expérience avec vous. Hola! Hi, my name is Emily and I study Economics at the College of William & Mary. I absolutely love traveling and I believe a person can grow and learn so much while being abroad. 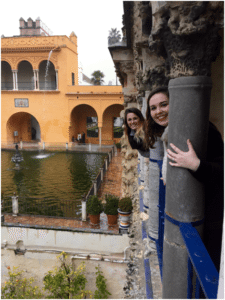 My four months in Sevilla, Spain with Centro Mundolengua were indescribably amazing! I grew personally while my Spanish improved exponentially. I am ready to plan my return trip to the beautiful Andalucía. Please feel free to ask me any questions! Hi! 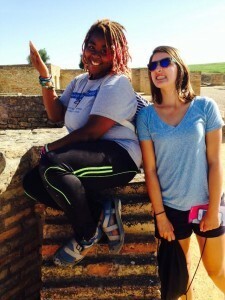 I'm Francie Sentilles, a senior at Hutchison, a high school in Memphis, Tennessee. I spent a month with Centro Mundolengua during the summer. Taking their Pre-AP Spanish Literature Course helped me get excited about taking the full year course in the fall - something I never though would be possible. I also spent two weeks completing the Community Service Program at a nonprofit called Pulseras Rosas, which helped me see a different side of Spanish culture and improve my language proficiency through experience. I absolutely loved every minute of my trip and cannot wait to come back, hopefully to study abroad in college. Until then, contact me if you have any questions about doing the Centro Mundolengua program as a high school student. Hello! 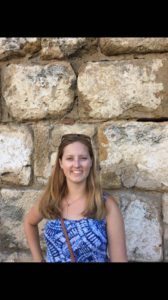 I'm Jenna, and I study Government and Finance at the College of William & Mary. 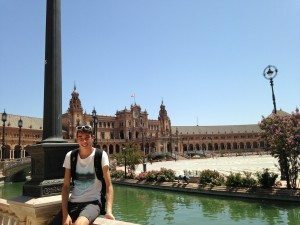 I'm spending the first semester of my junior year here in Sevilla, Spain, hoping to improve my language skills and broaden my cultural horizons. 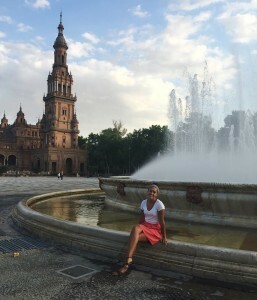 While in Sevilla, you might find me running by the Plaza de España, volunteering at the Red Cross, or trying a new flavor of gelato. I'm looking forward to a semester full of learning, exploration, and travel! Hey! I’m Jessie Bruno and I’m a Senior at Christopher Newport University. I am a Spanish major with a double minor in Leadership Studies and Sociology. I hope one day to use my degree in becoming an ESL teacher. 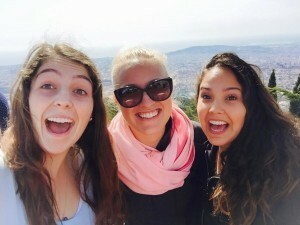 The four months I spent in Spain with Centro Mundolengua gave me the adventure of a life time. Through this program, I was truly ably to enrich myself culturally. I was also able to discover my passion for travel and expand my love of culture. If you have any questions, please let me know! Hello everyone! My name is Jordan and I attend Christopher Newport University. I"m a Senior studying Spanish and Education. After graduating, I will move to Spain. It is my dream to live in a Spanish-speaking country and Spain is the perfect place! I'll be an English teacher there. During my time with MundoLengua I have met many Spaniards who've helped me improve Spanish and get to know Spanish culture well. This opportunity to study abroad has been a truly gratifying experience. May the adventures continue! Salut ! Je m'appelle Julien, j'ai 21 ans et je suis étudiant en deuxième année à la faculté de traduction et d'interprétation de l'Université de Genève, en Suisse. L'apprentissage des langues m'a toujours passionné, et c'est pourquoi en juin 2014, j'ai décidé de partir six semaines à Cadix afin d'améliorer mon niveau d'espagnol avec Centro MundoLengua. Ce que j'en ai retiré ? Une expérience hors du commun, des rencontres marquantes, une famille d'accueil des plus incroyables, des amitiés qui dépassent les frontières, mais surtout des souvenirs inoubliables, ainsi qu'un goût pour les voyages démultiplié. Si j'ai envie de retenter l'expérience ? Bien sûr que oui... et sans hésiter une seule seconde ! Comme disait Saint Augustin : « Le monde est un livre et ceux qui ne voyagent pas ne lisent qu'une page. » Alors vous aussi, tentez l'expérience, et vous ne le regretterez pas ! Si vous avez besoin d'aide, n'hésitez pas à me contacter, je serais ravi de répondre à vos questions ! Hola! 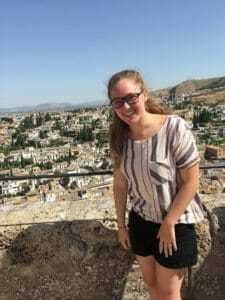 My name is Molly and study Spanish, Sociology, and Leadership studies at Christopher Newport University. 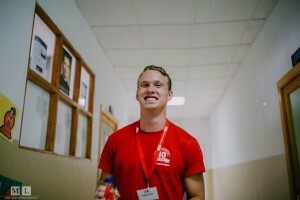 I want to be a language teacher after graduation and actually got the opportunity to volunteer in an english classroom in Sevilla thanks to CML. Not only did my semester abroad greatly improve my spanish speaking skills, but also my confidence in it. At the very beginning I was nervous talking to people, and by the time I was getting ready to go home I was 100% comfortable talking to anyone about anything. It's also a great opportunity for the avid traveler looking to get a whole lot of traveling under their belt! Let me know if you have any questions, i'd be more than happy to help! 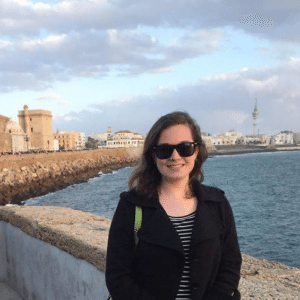 Hi, My name is Molly Russo and I am an English, Spanish, and Education major at Christopher Newport University. Studying abroad with Centro Mundolengua has been by far my favorite semester, as well as some of the best memories of my life. 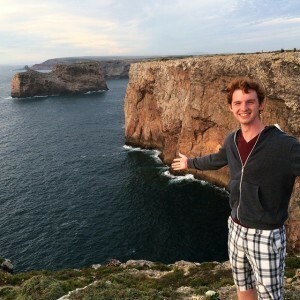 Studying abroad has ignited in me a passion for travel, and increased my love for the Spanish language. 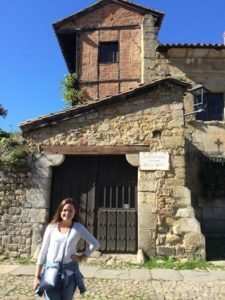 If you have any questions I would love to share with anyone hoping to study abroad in Spain: my personal ranking of the best chocolate croissants of Spain, and ,of course, the wonderful program that is Centro Mundolengua. Hi! I'm Patrick Davis and I'm a senior at Christopher Newport University. I am a Spanish major with minors in Leadership Studies and Sociology. I hope to use the knowledge that I have gained during my time in college and abroad to either live in another country or to assist foreigners living in the United States. Centro Mundolengua has given me the opportunity to truly live in another country and experience their culture firsthand. They have helped me through so much and I would love to be of any assistance that I can be! Hi! I'm Selena and I'm a junior at Christopher Newport University. 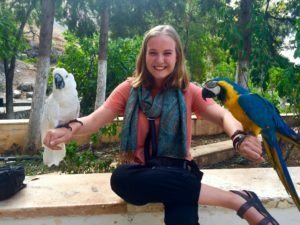 I am studying Communication, Spanish, and International Culture and Business, with a goal of using my degree towards traveling and helping people in other countries. Centro Mundolengua helped me discover how great traveling can be and I'd love to help you! My name is Shaquana Aikens and I am a 22 year old senior from Raleigh, North Carolina. I attend Winston Salem state university where I am pursuing a bachelor of arts degree in Spanish and Deaf Studies. Upon graduation I plan to work with Peace Corps or Teach For America working with children. At a very young age my family enstilled the value of traveling and seeing the world that I would read about in books. Hey! I’m Stephanie and I graduated from Christopher Newport University in 2015. I have a Bachelor of Arts degree in communication studies, along with leadership studies and Spanish. I studied abroad twice through Centro Mundolengua for a summer program in Cádiz and a full semester in Sevilla. My experiences through the program helped me find a passion for engaging with people, learning about different cultures, and expanding my horizons post-graduation. Centro Mundolengua has supported me through all of my travels and studies and I’d love to help you, too!